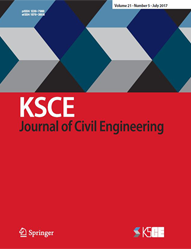 The KSCE Journal of Civil Engineering is a technical monthly journal of the Korean Society of Civil Engineers. The journal reports original study results (both academic and practical) on past practices and present information in all civil engineering fields. The journal publishes original papers within the broad field of civil engineering, which includes, but are not limited to, the following: coastal and harbor engineering, construction management, environmental engineering, geotechnical engineering, highway engineering, hydraulic engineering, information technology, nuclear power engineering, railroad engineering, structural engineering, surveying and geo-spatial engineering, transportation engineering, tunnel engineering, and water resources and hydrologic engineering. Both theoretical and practice-oriented papers, including case studies and reviews, are encouraged.